This project / assignment is titled the 3rd Rock Cafe Menu. Students are asked to select from the 3 options for each Entree, Main and Dessert. 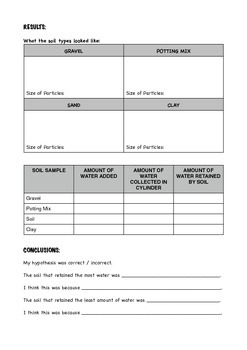 In the Entree section, students get to choose between researching about different types of landforms, the slow changes to Earth (weathering, erosion and deposition) and the fast changes to Earth (volcanoes, landslides and earthquakes). 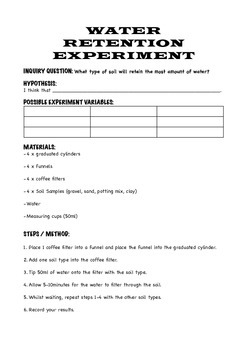 In the Main section, students will be conducting an experiment based on water retention in soils, wave energy / coastline erosion, or soil erosion. 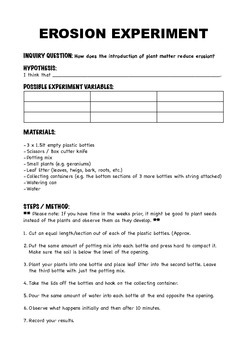 Each of the three experiments come with a 2 page practical worksheet and includes a list of the materials and method needed for each experiment. 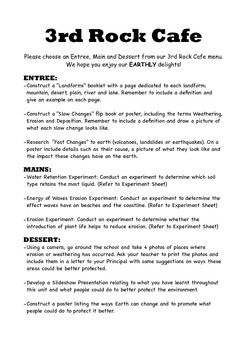 In the Dessert section, students will have the opportunity to reflect on their learning by writing a letter to their principal highlighting the eroded areas of the school and ideas to fix the problem, developing a slideshow presentation detailing what was learnt or constructing a poster showing how the earth can change. Overall, this project will appeal to the learning styles of most students as student are given the freedom to choose the activity they would most like to complete.